1. William Blake, “Angels Gathered Around a Book,” c. 1785. Pen and wash over pencil, 32.5 × 40.5 cm. Colnaghi, London. 2. William Blake, “Moses with the Tablets of the Law,” c. 1780-85. Pencil, 20.8 × 14.6 cm. Private collection, Great Britain. 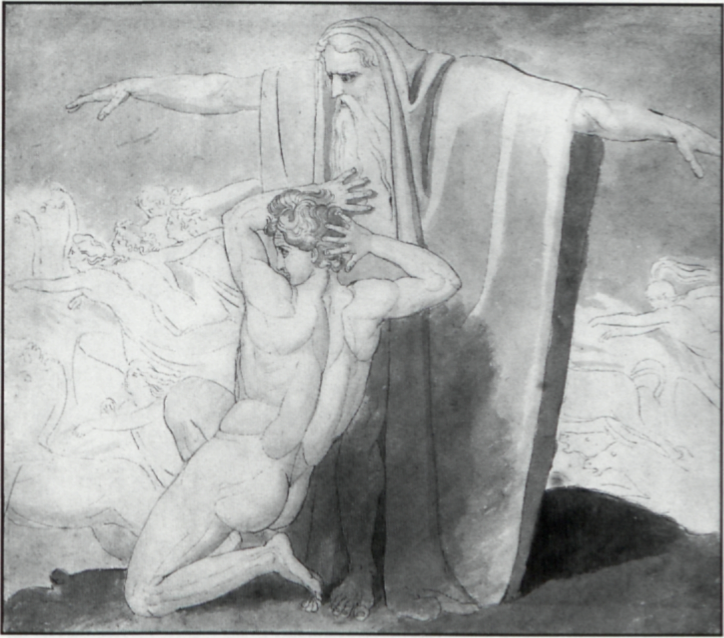 that related directly to well-documented works by Blake, such as the two sketches (B 159 recto and verso) for “Joseph Making Himself Known to his Brethren,” exhibited at the Royal Academy in 1785 (B 157). 3. William Blake, “Three Naked Children Crouching Around a Source of Light,” c. 1785. Pen and wash over pencil, 14.3 × 19.2 cm. Thos. Agnew & Sons Ltd., London. 4. William Blake, “A Young Man Seated Behind a Stone Slab,” c.1785. Pen and wash over pencil, 14.3 × 14.5 cm. Private collection, London. 5. William Blake, called “The First Sight of the Spiritual World,” c. 1785. Pen and wash over pencil, irregular, 48.5 × 56 cm. Courtesy of the Harvard University Art Museums (Fogg Art Museum; bequest of Grenville L. Winthrop). Gallery, at present called “An Allegory of the Bible” (B 127). This drawing is fairly exceptional among Blake’s early works in showing a good feeling for the solidity of the body beneath the flowing draperies, and the sense of graceful contraposto, particularly in the foremost angel on the right, is particularly striking; it can be compared with that of the figure of Christ in the version of “The Good Farmer” in the collection of Robert N. Essick (B 122 recto) or the left-hand fairy in “Oberon, Titania and Puck with Fairies Dancing” in the Tate Gallery (B 161). What is particularly noticeable is the sense of movement in the figures on the right (how many angels exactly are there? ), produced by the pentimenti by which Blake has changed the position of the angel’s leg. 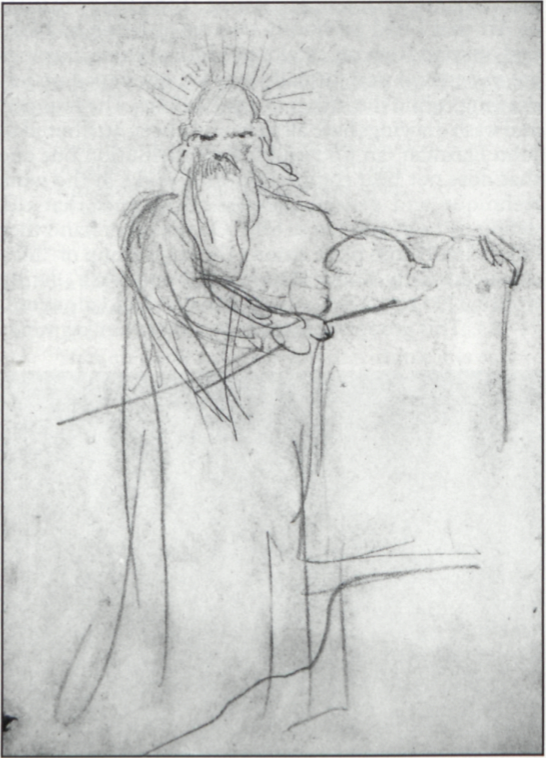 Something of the same effect is seen in the pencil drawing of “Moses and the Tablets of the Law” (illus. 2), another of the newly discovered drawings. Pencil drawings of this type are exceptionally difficult to date but this one would seem to relate to the series of pen and wash drawings dealing with the story of Moses, dated by me to the first half of the 1780s (B 111-15). The forcefulness of this drawing, linked with a certain stiffness and angularity of line, is found in such pencil drawings as that of a “Man with Arms Upraised, Perhaps the Resurrection” in the National Gallery of Art (B 78 verso) and “The Resurrection of the Dead” in an American private collection (B 79), both dated by me to the early 1780s. Another of the newly discovered drawings in pen and wash (illus. 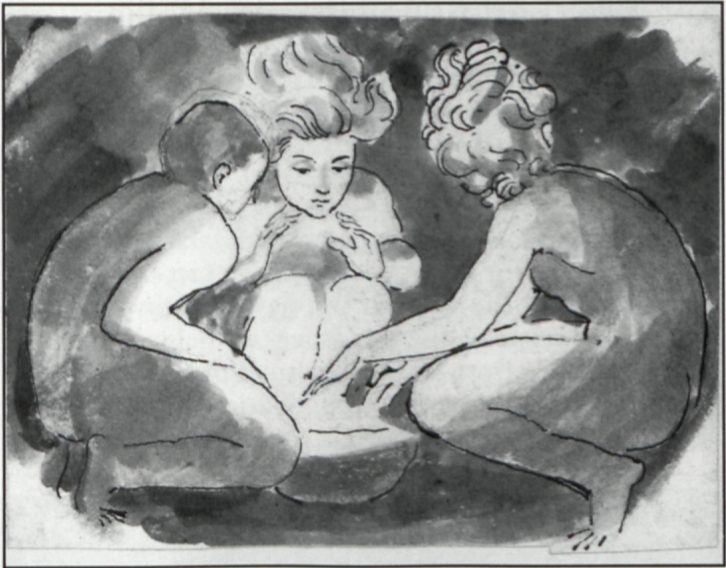 3) shows three naked children crouched round a bowl-like source of light by which they are illuminated. As in the case of the drawing of “Angels Gathered Around a Book” the precise subject is difficult to ascertain, but again one senses a reference to Swedenborg. The relatively heavy outlines are, allowing for the difference in scale, relatively close to the drawings for the Job and Ezekiel engravings already mentioned. Very similar in style is the drawing (illus. 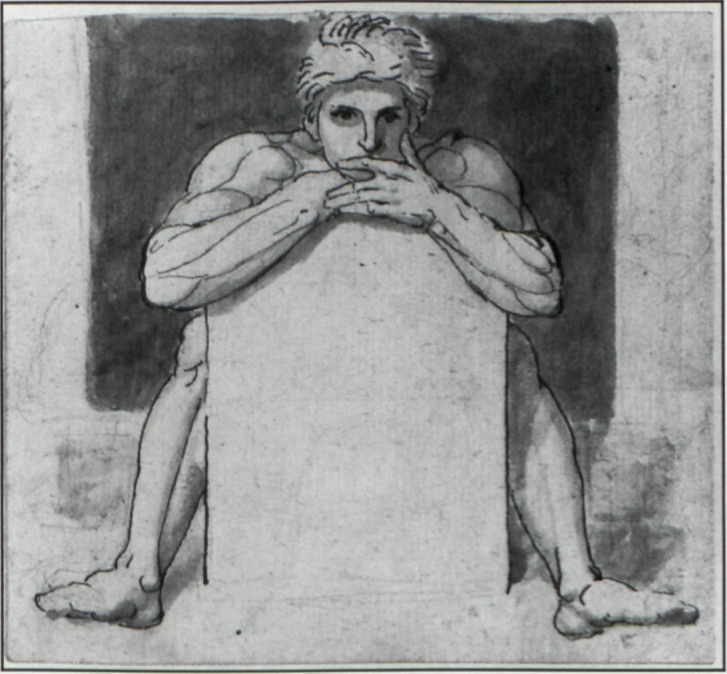 4) of a young man shown seated behind a slab of stone on which he rests his arms, though this is carried slightly further in that the muscles of the arms and legs are suggested by lines within the general outlines. Mark Fisher has suggested that this might be a design for a bookplate. 6. William Blake, sketch for “Joseph’s Brethren Bowing Before Him,” c. 1785. Pen and wash over pencil, 33.5 × 47.4 cm. Courtesy of Sammlung der Zeichnungen, National-Galerie, Staatliche Museum, Berlin, DDR. 7. William Blake, “The Complaint of Job,” c. 1785. Pen and Indian ink, 33.2 × 47.1 cm. Thomas Gibson Fine Art Ltd.
d’Hancarville in the British Museum (B 174 and 175). The helmet of the figure on the right in the background also suggests a classical subject though it is difficult to see what this might be. Little if anything is known of the history of these drawings. The one in the Fogg Museum was purchased by Grenville L. Winthrop from A. J. Finberg at the Cotswold Gallery in London in 1923 and was displayed in the exhibition of Drawings by J. M. W. Turner, William Blake, Samuel Palmer and Others held there in July 1923. On the back has been written the number “504” and, more interestingly, “This belongs to JLG/by Blake.” However, the only JLG that I can trace is Mrs. John L. Gardner who, with George N. Black, presented the Thomas Butts set of illustrations of Milton’s Comus to the Museum of Fine Arts in Boston in 1890. If the drawing did belong to John L. Gardner it would have to have returned to London by 1923. The other drawings have no history before they turned up, separately, in the art trade recently. The drawing of “Angels Gathered Around a Book” turned up, perhaps significantly, in Germany, the others in Britain. Since the appearance of the four new drawings discussed above, my friend David Bindman has kindly drawn my attention to another of the early group of pen and wash drawings, found by him in the National-Galerie in East Berlin. This is in fact an additional key work in dating the whole group, being a preliminary sketch for “Joseph’s Brethren Bowing Before Him” (illus. 6), one of the three watercolors of Joseph subjects exhibited at the Royal Academy in 1785 and now in the Fitzwilliam Museum, Cambridge (B 155). This new discovery begin page 111 | ↑ back to top means that we now have sketches for all three of the group, one of which is the sketch with a certain amount of color for “Joseph Ordering Simeon to be Bound” now in a private collection, Milan (B 158); the two others, in pen and ink, the recto and verso of a sheet, are in the Royal Collection at Windsor Castle (B 159). 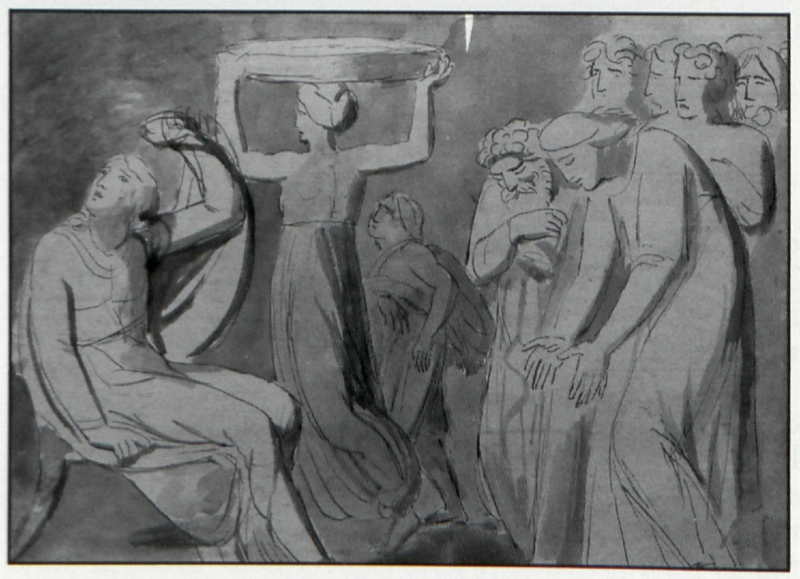 What is interesting about the new sketch is that it differs considerably from the final watercolor—Joseph is placed on the opposite side of the composition, though in the same pose deriving from the antique—with the prominent figure, also from the antique, of a girl holding a large dish on her head again filling the space between Joseph and his brethren. It never rains but it pours! No sooner had I posted off the preceding paragraph to the ever compliant editors of Blake than yet another of the early pen and wash drawings appeared, this time one included in my catalogue as “Untraced since 1928” (B 163; illus. 7)3↤ 3 This work has been brought to my attention through the good offices of Mrs. Gottesman at Thomas Gibson Fine Art Ltd. It measures 13 1/16 × 18½ in. (33.2 × 47.1 cm) and is on laid paper. The recto is in pen and wash, the verso, which is an upright, in pencil. It has apparently remained in a single British private collection since the sale of 1928. . 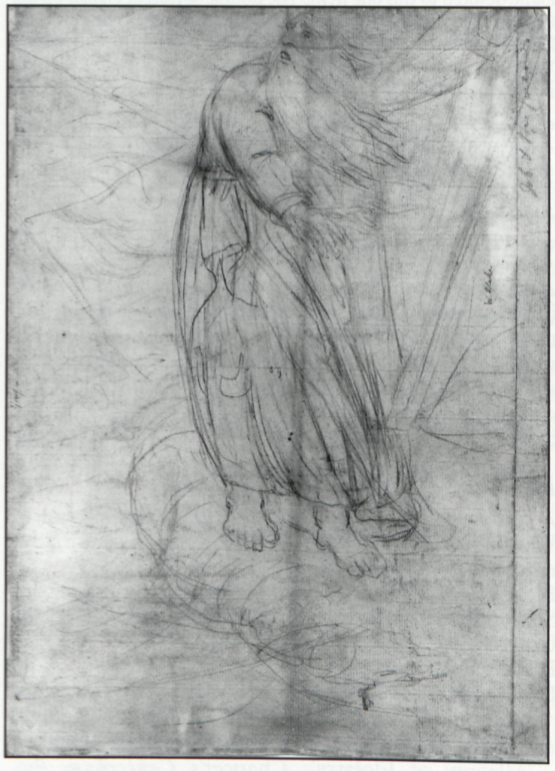 This is the intermediate sketch of “The Complaint of Job” of about 1785, falling, as Geoffrey Keynes said it did, between the verso of the drawing in the Tate Gallery (on which Blake takes the figure of Job’s wife from the recto and redraws it in the pose that he was to retain through the subsequent sketches until it appeared in the engraving “Job. What is Man That Thou Shouldest Try Him Every Moment?”) and the more finished pen and wash drawing formerly in the collection of T. E. Hanley and now in the Fine Art Museums of San Francisco (B 164). It bears exactly the same relationship to the drawing in San Francisco as does the Homans drawing of “The Death of Ezekiel’s Wife” to the more finished version in the Philadelphia Museum of Art (B 165 and 166). The drawing on the reverse also fits with what was known about the formerly untraced drawing, showing a full-length figure, fully draped, with wild locks and beard as described in the Sotheby’s sale catalogue for 17-21 December 1928 (illus. 8). The appearance of this drawing on the reverse was the more exciting because of its close resemblance to the two drawings labeled “Ossian” in the newly rediscovered larger Blake-Varley sketchbook, sold at Sotheby’s on 21 March 19894↤ 4 Lot 184. The sketchbook is fully illustrated in a separate catalogue devoted to this one item. The double spread of Ossian occurs on pages 33 verso and 34 recto, and the single head on the following page, 34 verso. . It resembles both the double-page spread showing the figure full length holding his harp on the edge of a cliff with a landscape to the left, and the page devoted to his head alone. Moreover at first glance the drawing looked to be later in style than that on the recto. However, two factors suggest that it is more likely to date from about the same time as the recto or slightly earlier. First, the figure fits uneasily on the page as it now stands, cramped at the top and with plenty of space below. Indeed there are signs that the page was cut and the paper trimmed all round. The composition of “The Complaint of Job” on the recto however fits the page very nicely, with slightly more space around the figures, particularly on the left (which is the top of the verso), than in the more finished pen and wash drawing in San Francisco. This implies that the drawing on the verso was probably done first, the paper then cut, particularly at the top, and then used for the recto. 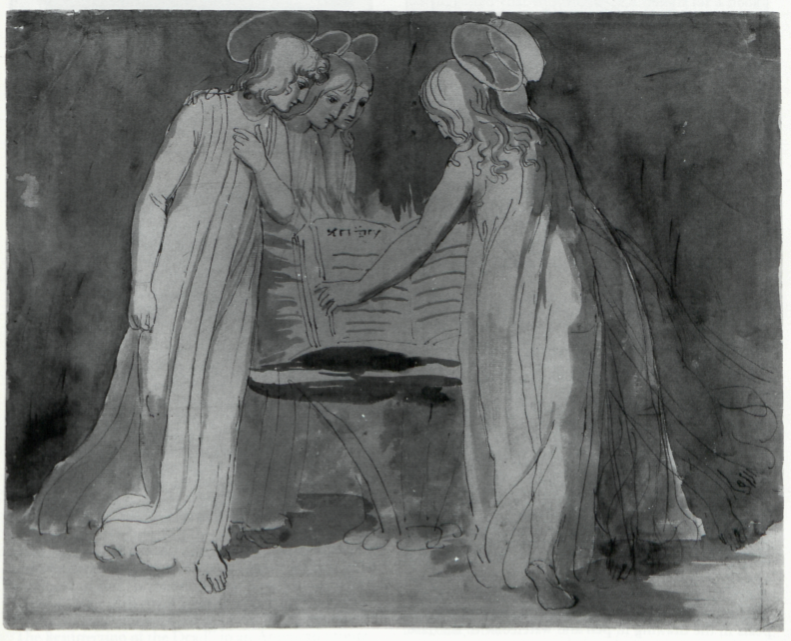 Moreover the subject of the drawing on the verso, though prefiguring the Ossian of the larger Blake-Varley sketchbook, could equally well be the Bard; the drawing seems most likely to have been a preliminary sketch for the lost work, almost certainly a watercolor, exhibited by Blake at the Royal Academy in 1785 as “The Bard, from Gray” (B 160). 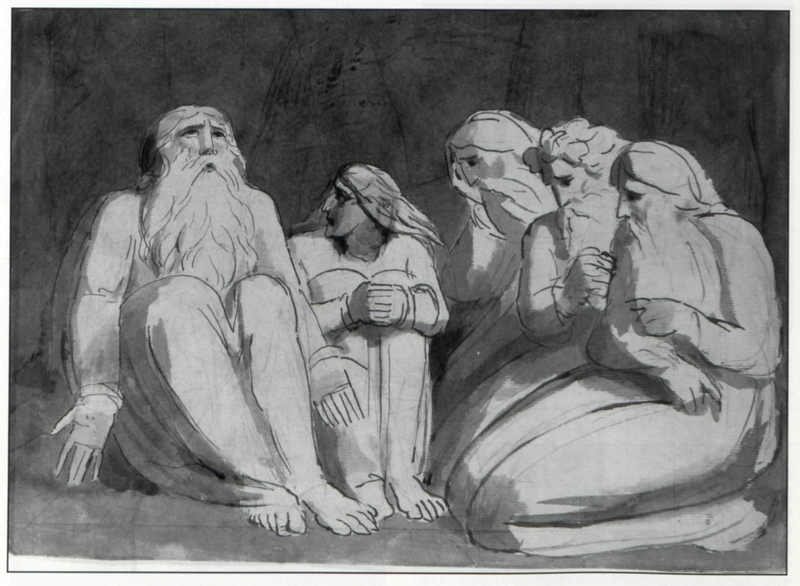 The composition lacks the figures of the royal train and deceased bards that appear in the tempera included by Blake in his exhibition in 1809 and now in the Tate Gallery (B 655), but the other evidence suggests that we now have, in this newly discovered drawing, at least an idea of the appearance of the 1785 exhibit. It was this work of his youth to which Blake returned when asked by John Varley to see Ossian in a vision. 8. Sketch for “The Bard, from Gray,” c. 1785. Pencil, 47.1 × 33.2 cm. Verso of “The Complaint of Job.” Thomas Gibson Fine Art Ltd.